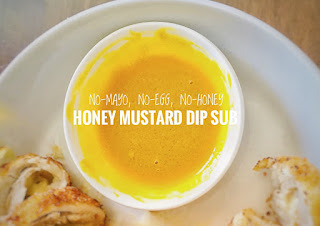 We found ourselves needing Honey Mustard Dip once for our Homemade Chicken Cordon Bleu, but we did not have any mayonnaise or honey. This was when I gave birth to this dip recipe. This was much like an “improv that went great” kind of recipe. It was a sketch that ended up what it was intended to be. Remembering the taste profile of the dip was all I used to guide me. Nonetheless, it tasted great and so I share it here in the blog as well. 1. Mix everything in a dipping bowl or saucer. Wasn’t that simple? Yet, it had the tang, and sweetness still that we like about the dip. It works for us, how did it work for you? It was perfect for our Homemade Chicken Cordon Bleu recipe here. For questions, comments, and suggestions, feel free to write them below or send us a message. On to the next munchtrip!